This was the last big feature I had to convert to .NET for Diving Log 5.0 – the print function with the report designer. Like all other features I’ve completely restructured the whole code and interaction with the report engine List&Label. And I’ve added several new features and improvements. 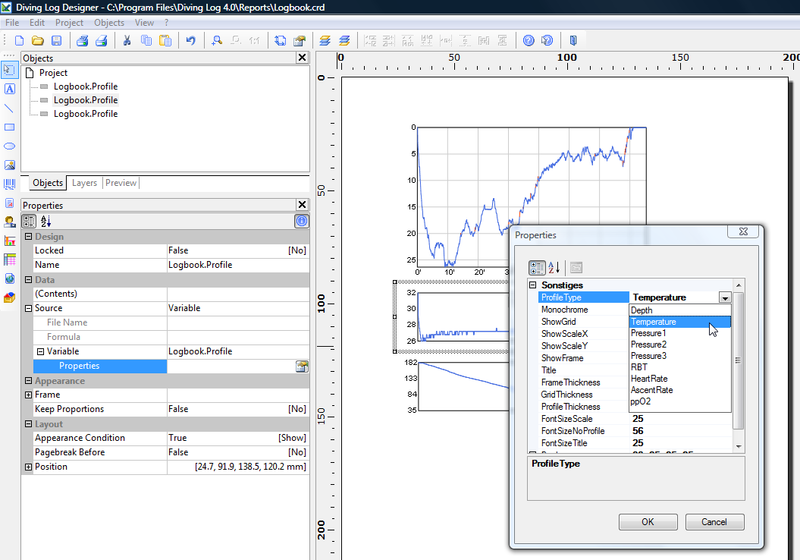 Below you can see the new print dialog with some visual changes. One minor improvement is that it will remember the last printed dive number and use it as start number when you open the dialog the next time, which makes it a little bit easier to print only the new dives. The biggest improvement has been added to the dive profile printing. 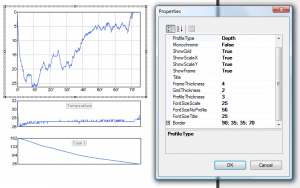 Up till now you could only print the depth profile with very little customization properties. 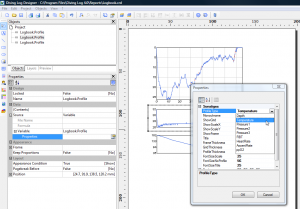 In version 5.0 the print engine uses exactly the same profile drawing routine as the profile display in the logbook window. 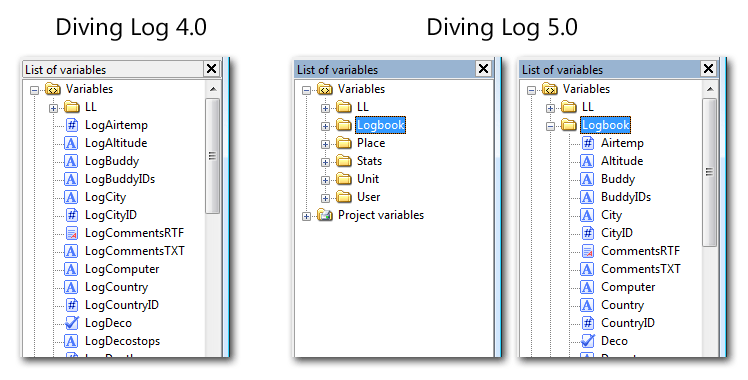 So you have the same profiles and features at the same time as they are implemented into the logbook window. 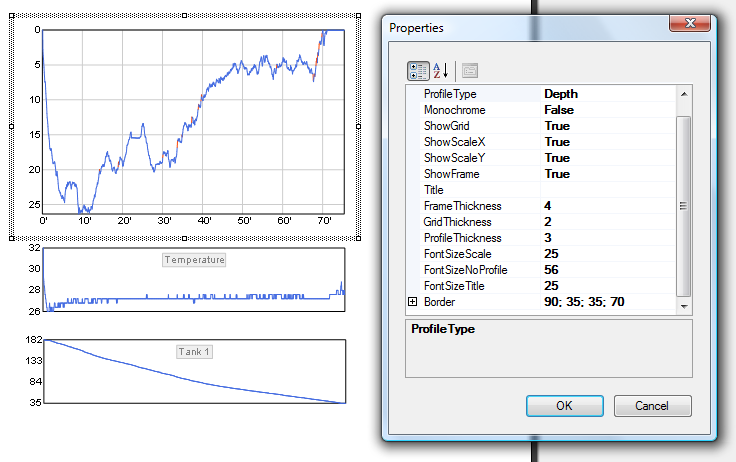 You can drag several profile objects to the designer and change the profile type and other options by double clicking the profile or by clicking the properties icon on the left side. When you use the profile field in a list type report, the profile will be automatically drawn in a minimalistic way without text and scales, so it fits best into the small table rows. The 2nd major improvement is the buddy signature drawing. You have now also several options to customize the design. 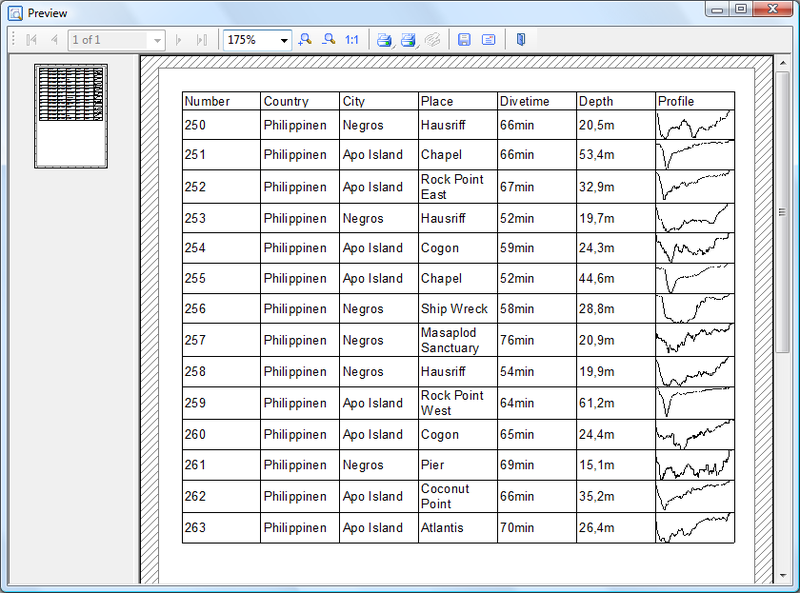 The same drawing will be used in the logbook window, too. 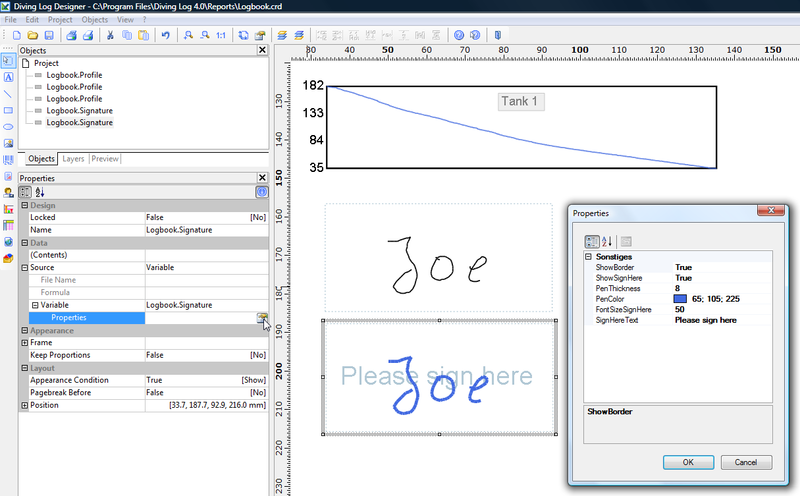 Currently you can create new signatures only in the Windows Mobile version, but in version 5.0 you will be able to sign a dive also in the desktop version (with the mouse or with touch enabled devices). So, now as the print function is complete I’ll write next a blog post which gives you an overview where we are at the moment, features which has to be done until a possible beta release and what will be skipped and not included in the first beta to delay the release not unnecessarily. Thank you for your patience during this long time update, I’m also very excited, but this is really a major task which takes some time. This entry was posted on Thursday, June 4th, 2009 at 9:54 pm and is filed under Diving Log 5.0. You can follow any responses to this entry through the RSS 2.0 feed. Both comments and pings are currently closed. What would be good is to have multiple saved reports. 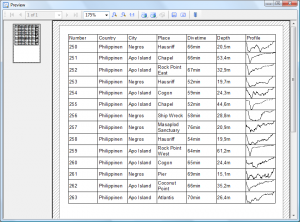 At the moment, if I want to print out my logbook index, and then a logbook page, I need to select the .crd or .lst file. 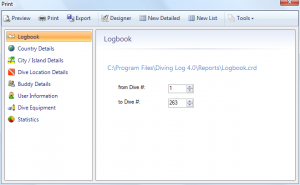 DivingLog only remembers the last logbook printout, rather than the last logbook full page report and the last logbook list report. Thank you for your feedback! I was thinking about your suggestion and it is not easy to reduce the number of clicks it takes. Currently you have to make one click on the blue link with the current report file and a double click in the “Open File” dialog on the new report file (when both files are in the same folder). All possible solutions I could imagine still require at least 2 single clicks to change the report file. For example I could include a “last 5 reports used” history in the “Tools” menu you can see in the first screenshot. But you have to do one click to open the menu and one click to select the report file. I’m open to any suggestions, but currently I can’t imagine a better way to change the current report file. How about a radio selection of “List” or “Detail”. If “List” is selected, it defaults to the last .lst file used for the selected report type, and if “Detail” is selected, it defaults to the last .crd file used. I’m not sure about this. It would work for this special case, but it could be confusing for new users or would not work for users who are using 2 detailed reports, for example. I think I keep it for the moment this way because I have plenty of other feature request I have to work on. This one is not that important, because you can select any report file with just 2 clicks. 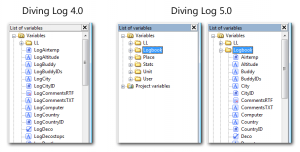 In the 5.0 print dialog the open file dialog will start in the same directory as the current file. So if both of your files are in the same folder (no matter where on your hard drive), you simply have to click the blue link (which is easier than the small button in 4.0) and do another double click on the other file. I understand that this could be done more easily in your case, but I’m not sure how many users are really using both report types, I think most of them are using only a single report file.